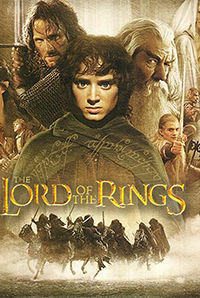 The Lord Of The Rings : The Fellowship of the Ring (Part 1) is a Action Adventure movie. Movies starcast is Cate Blanchett, Ian Mckellen, Harvey Weinstein, Bob Weinstein, Orlando Bloom, Christopher Lee, Peter Jackson, J.R.R. Tolkien, Fran Walsh, Philippa Boyens, Andrew Lesnie, Elijah Wood, Ian Holm, Noel Appleby, Sean Bean, Viggo Mortensen, Sean Astin, Billy Boyd, John Rhys-davies, Dominic Monaghan, Barrie M. Osborne, Robert Shaye, Michael Lynne, Mark Ordesky, Sala Baker, J. R. R. Tolkien, Alan Howard, Martien Coucke, Tim Sanders, John Gilbert, Elijah Wood (Voice), Sean Bean (Voice), Ian Holm (Voice), . 0% people like this.The Lord Of The Rings : The Fellowship of the Ring (Part 1) Movie release in .